Drew Brees killed the Eagles Week 11. The Philadelphia Eagles will roll back into New Orleans this Sunday to take on a Saints team that embarrassed them to the tune of 48-7 back in November. Will things be different this time around? Here are five matchups to watch when the Saints have the ball. That's a clinic. If Brees is on, no matter how ready the Eagles are to play, the Saints are going to be extremely difficult to beat. However, there is some hope in the fact that Brees didn't have an MVP-like final quarter of the season, and it's also worth noting that the Saints haven't played in a game that has mattered since Week 16 (and even then there wasn't much pressure). How did Nick (Foles) get his provocative nickname? 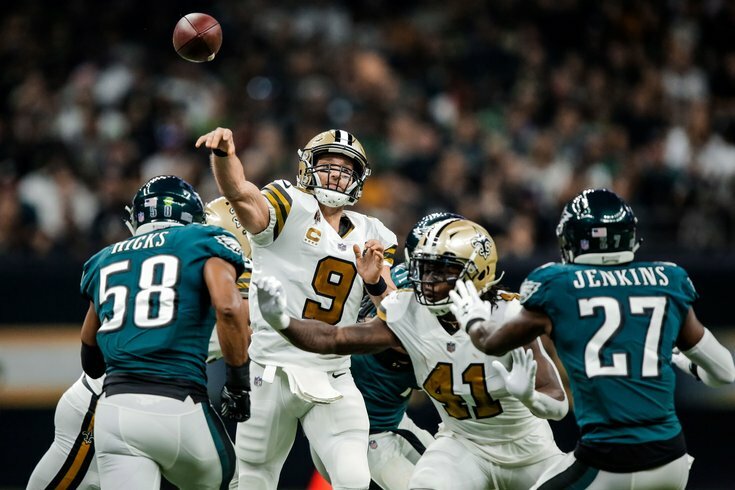 One of the reasons Brees was able to make some of the throws he made against the Eagles Week 11 was because of the stellar pass protection he received from his offensive line. On the day, the Eagles had no sacks, and they were able to hit Brees just once. On the 2018 season, Brees averaged 2.59 seconds from snap to throw, which was the fourth-fastest in the NFL, and only .04 seconds behind the two fastest quarterbacks to get rid of it, Ben Roethlisberger and Derek Carr, who both averaged 2.55 seconds. That is certainly a big a reason for the Saints' 20 sacks allowed (second-best in the NFL), and 52 QB hits allowed (best in the NFL). However, the Eagles are still going to have to find a way to do a hell of a lot better getting after Brees than they did in November. • LT Terron Armstead: Armstead missed the Week 11 game against the Eagles, and Jermon Bushrod filled in. Armstead had torn a pectoral muscle Week 10 against the Bengals, and sat out until Week 16 against the Steelers. In that game, Armstead re-aggravated the injury, came out, didn't return, and sat out the following meaningless Week 17 game against the Panthers. • OT Jermon Bushrod: Against the Eagles Week 11, with Armstead out, Bushrod filled in at left tackle and played well. He injured his hamstring Week 15 against the Panthers, and did not play Weeks 16 or 17. After Armstead left the Saints' Week 16 game against Pittsburgh, the Saints kicked LG Andrus Peat out to LT, and rookie seventh-round pick Will Clapp filled in at LG. • LG Andrus Peat: Peat left the Saints' meaningless Week 17 game with a left hand injury and did not return. • RG Larry Warford: Warford finished the Saints' Week 16 game vs. Pittsburgh, but he appeared on the injury report prior to their Week 17 game with a knee injury, and did not play. According to Luke Johnson of NOLA.com, while the Saints did not have to submit an official injury report on their bye week, Armstead, Peat, Warford and Bushrod did not participate in periods of practice last week that were open to the media. The Eagles could potentially benefit from either missing, or not-quite-100-percent players along the Saints' offensive line. Jalen Mills and Ronald Darby were already done. Sidney Jones played, but he shouldn't have as he was clearly hampered by a hamstring injury, and the Saints knew it. Avonte Maddox got hurt in this game, and had to leave after playing just 17 snaps. Cre'Von LeBlanc was playing in just his second game with the team, after the Eagles had poached him from the Bears' practice squad just 13 days prior to the Eagles-Saints game. Chandon Sullivan and DeVante Bausby both played a significant number of snaps. Sullivan played 26 snaps, while Bausby played 24. They both got abused. Rasul Douglas started, and wasn't playing well at the time. Maddox is healthy again, and has proven to be a playmaker (though there are new concerns about susceptibility to double moves). LeBlanc has "solidified the nickel spot," per Jim Schwartz. Sullivan and Bausby are mercifully gone. Douglas has played far better over the last month than he did earlier this season. In Week 11, the Eagles didn't really stop anybody, but the Saints' best receiver — and one of the best in the game -— is Michael Thomas, who had 125 catches for 1,405 yards and nine TDs this season. Incredibly, Thomas had those 125 catches on just 147 targets, meaning that the Saints connected on more than 85 percent of the throws that went Thomas' way in 2018, which is insane at the wide receiver position. While they'll still more than have their hands full on Sunday, the Eagles' secondary is far better equipped to handle the Saints' passing attack than it was Week 11. It wasn't just Brees who killed the Eagles Week 11. The Saints also ran it all over the Eagles that day. Mark Ingram had 16 carries for 103 yards and two TDs, while Alvin Kamara chipped in 71 yards on 13 carries. On the 2018 season, the Saints were 6th in rushing yards per game (126.6), first in rushing touchdowns (26), tied for second in rushing first downs (134), and third in percentage of rushes resulting in a first down (28.5 percent). They Saints have a balanced offense that is equally frustrating when they run or pass. "I think that when you talk about run defense, people generally talk about the front seven and their ability," said Schwartz on Tuesday. "But it's layered well beyond that. It is the front seven. It's every man knowing their job. It's finishing tackling. One guy missing a tackle can make a whole scheme look bad. It can make ten other players look bad. "Most of the tackling like I've said before has to do with positioning and knowing where your teammates are and where you fit in the scheme, and I think over the second half the season, I'd say the that guys have settled into that and you're seeing those guys knowing where they are and it's resulted in better tackling. Our secondary has tackled better. Our front seven we've always relied on those guys, but everybody knowing their role within it. That's something that's developed over the last half of the season." On Sunday against the Bears, the Eagles recognized that Tarik Cohen was the most dangerous weapon in Chicago's offense, and they sought to shut him down, which they did successfully. On the day, Cohen had 1 carry for 0 yards, and three catches on five targets for 27 yards. "Most of that credit goes to Nigel Bradham and Malcolm Jenkins," Schwartz said. "They had a huge hand in that. I can't say enough about how those guys played, because even the one play that he went down the field, that was neither of those guys’ coverage. It wasn't just stopping the pass; it was stopping the run. Some of the pass, we were treating him like he was a wide receiver and that went to Cre'Von [LeBlanc], and Cre'Von is one of those guys that's really stepped up for us." In New Orleans next Sunday, the Birds will be facing a similarly dynamic running back with receiving ability in Kamara. It will be interesting to see if the Eagles are able to defend Kamara in a similar way, or if the multitude of Saints offensive weapons won't allow that.